TC²: Creating the Perfect Fit Finding the perfect apparel for someone’s body shape seems quite tough and challenging. In this modern era the retail industry has no standard sizing system for all brands. So to solve this major issue regarding to give accurate apparel for the people a new technology has developed and that is 3D body-scanning technology. A 3D body scanning is a technology is a noncontact technology that is used to capture the shape of the human body through a line of laser lights or with the help of a camera. This advance technology records the body’s exact shape and size and creates a 3D digital model of the body within the seconds. The use of 3D body - scanning technology can help the apparel companies create garments with more accurate fit by providing the true and right measurements of customers of different shapes and sizes. And TC ² is exactly does the same for you and gives you the satisfying result through its superior techniques. 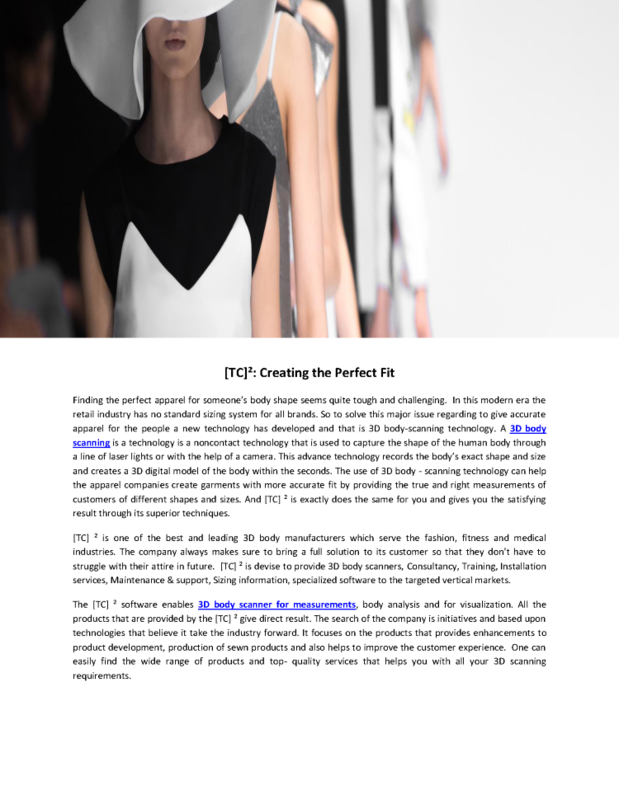 TC ² is one of the best and leading 3D body manufacturers which serve the fashion fitness and medical industries. The company always makes sure to bring a full solution to its customer so that they don’t have to struggle with their attire in future. TC ² is devise to provide 3D body scanners Consultancy Training Installation services Maintenance support Sizing information specialized software to the targeted vertical markets. The TC ² software enables 3D body scanner for measurements body analysis and for visualization. All the products that are provided by the TC ² give direct result. The search of the company is initiatives and based upon technologies that believe it take the industry forward. It focuses on the products that provides enhancements to product development production of sewn products and also helps to improve the customer experience. One can easily find the wide range of products and top- quality services that helps you with all your 3D scanning requirements.